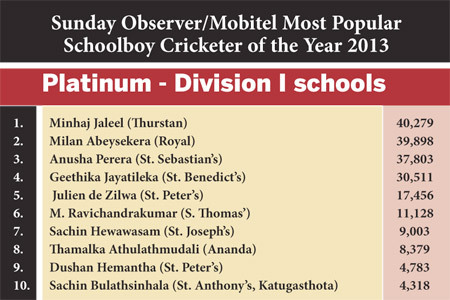 Thurstan’s Milhaj Jaleel (40,279) took over the lead from Royal’s Milan Abeysekera (39,898) with a majority of 381 votes at the end of the 15th week count in the Sunday Observer/Mobitel Most Popular Schoolboy Cricketer of the Year 2013 Platinum segment for schools taking part in the SLSCA Division I Cricket tournament. The top three places in the Platinum Contest have been fluctuating between Jaleel, Abeysekera and Perera. In the Gold competition for schools taking part in the Division II SLSCA tournament there is a stiff fight between number one Yamal Siriwardena (33,901) of St. John’s Nugegoda and Sakunda de Silva (32,716) of Sri Devananda, Ambalangoda. Siriwardena who has been occupying the number one slot for several weeks is now being challenged by de Silva who is only 185 votes behind and Cheruka Herath Sri Sumangala, Panadura (32,007) in the third place. 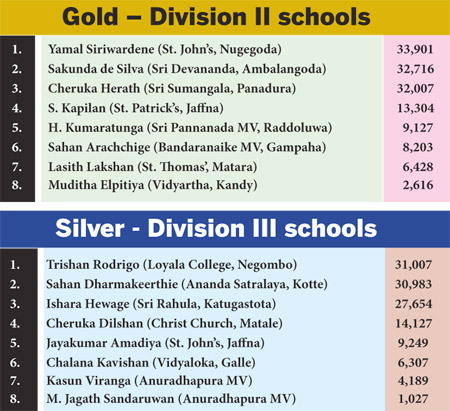 In the Silver competition for Division III schools Trishan Rodrigo (31,007) of Loyala College, Negombo took the lead from Sahan Dharmakeerthie (30,983) of Ananda Sasthralaya, Kotte who was placed first last week.